People are often confused by what the term "Socially Responsible" or "Ethical Investing" really means. This lecture/workshop describes the different strategies employed by responsible investors, including screening, community investment, and corporate resolution tactics. We delve into the advantages and pitfalls of each in terms of both financial gain and social effectiveness. I take you through the steps to decide whether an investment is right for you both financially and socially. Most importantly, we look at what options are open to investors from the smallest choice to the largest investment. My vision for the future is one where every act is in harmony with nature's ecosystem: ATM machines and laptops that return to the earth to feed birds and worms. An economy where waste=food and where the flow of money means a win, win, win, win, win occurred. A world where the environment and people are the top business issues, because it's logical and because it's intuitively right. I envision a world where the terms "Socially Responsible" and "Eco-Friendly" are no longer used, because it's simply the way things are done. America committed to helping people create their vision for the future through their investments. By using socially responsible investing and sustainable investment planning, her aim is to help clients create a financial strategy that can sustain their retirement as well as a forest preserve. She is dedicated to finding ways for capital and business to nurture people and the environment. 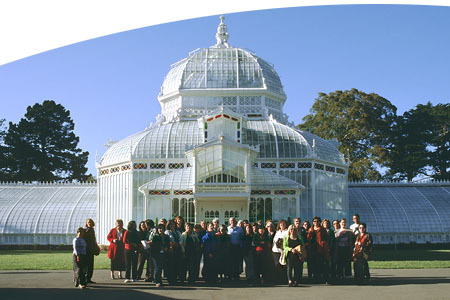 The tour of the Conservatory of Flowers was a huge success. 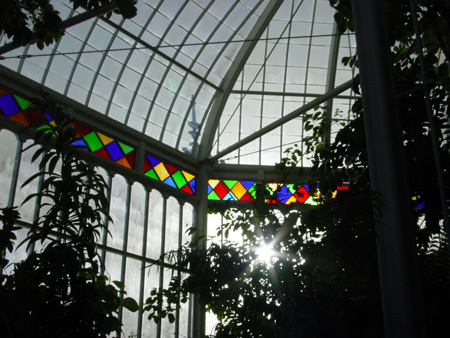 Scot Medbury inspired us all with his stories of the history of the original conservatory, and the process of fund raising and reconstruction, after the 1995 winter storms. 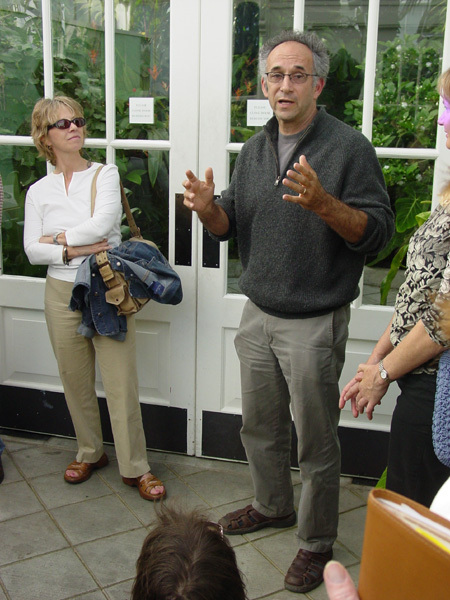 We also met with the conservatory's curator, who took us to the boiler room, and Jeff Miller, who installed the plants after the building was complete. Please see some photos from this event below, at the end of the newsletter. In appreciation of this wonderful event, the steering committee voted to donate the funds collected at the tour (plus a little more) to the conservatory. A check for $500, plus a "thank you" gift for Scot of the NY Museum of Modern Art landscape competition publication, Groundswell, will be sent soon. It is encouraging to see the amount of traffic on the Yahoo Group, the web hosted bulletin board for sending and receiving messages to those who have signed up. Currently, the group is open to anyone interested as an introductory offer. Eventually, only active paid members will have access. It's a great way to find carpoolers, consultant recommendations, job postings and answers to all sorts of design related questions. We hope that the usage continues to grow. Contact Hana Mori at hana@owa-usa.org , if you have further questions. Regarding the status of the website upgrades that the members approved, the basic system has been built, so now all the information needs to be linked to the system and posted to the web. Once the upgrades are complete, the OWA member database will be linked to the website, making synchronizing information much simpler. The website will still be publicly accessible, but there will also be a log-in procedure that will give paid members access to a "members only" section of the website, which will contain the full member directory (where they will be able to search for information on other members), photo journals, and other special information. Members will be sent an email, requesting that they create a user profile for themselves that will be linked to the website database, and will confirm their current information. At that time, they may select whether they want their information shared at all, shared with other members or with the general public. Each member will log into her own personal home page that she can update and customize. I still marvel at my good fortune, or perhaps karma, at having the opportunity to work in Tibet on two occasions. My first trip was in 2001 while I was still working with Van der Ryn Architects. Then, Sim and I made a trip to Shigatse, Tibet, to master plan an ecovillage, as part of a larger park development. This second trip in August 2004 was to Tedrum Village, about 3 hours east of Lhasa, on a good travel day. This time our team included Jeff Oldham, of Real Goods, a renewable power consultant, and Patrick Curran of SWA for watershed and landscape planning. Leaving Lhasa, heading east to Tedrum, I'm struck again by the rugged beauty of the land and the boundless warmth and compassion of the Tibetan people. Working with an American non-profit organization, The Mountain Institute / Peak Enterprise Program focuses on assisting the people in the Tibet Autonomous Region of China develop a sustainable economic future through sector development and business initiatives that build on traditional livelihoods and appreciation of Tibet's rich natural and cultural heritage. Previously, TMI has implemented ecological restoration programs in this valley, and have successfully established other local economic development models throughout Tibet and Nepal. As we reach Tedrum Village, which is about 14,000 ft. above sea level, I recognize that this is one of the most pristine places left on earth. The river still runs clear and fresh and the water is safe to drink, at least above the village. We're only about 500 ft. below the headwaters, where there are ancient and rare species of plants and animals, and the ever present yak. There are about 250 nuns living here today, carrying on this Buddhist tradition of over 800 years. It is an extremely sacred area and is blessed with natural healing hot springs, one of the main attractions to this region. Considering the 8 centuries of habitation, the buildings and landscape are in amazingly good condition, though also in extreme need of repair. We arrive in Tedrum 3 days after a pilgrimage that has brought 100,000 visitors to this village. This event occurs every 12 years, as this is one of twelve sacred sites in Tibet corresponding with the annual religious celebrations. We immediately notice the impacts of garbage&emdash;a western invention&emdash;on remote areas. Heretofore, there was no need for garbage containers or recycling because there was no packaging. It's a struggle for these areas to keep up with the refuse and a dilemma about how to deal with it. They do a fairly good job of recycling because the items that can be recycled are viewed as a resource, but tossing garbage in the river, or burning or burying the non-recyclables seem to be the main options. TMI practices participatory planning in all of their programs, and they've done an excellent job gathering programming information and preparing the local community for the work to be done. We spend a day meeting with the village and hiking the many hectares, investigating opportunities for renewable power generation, determining areas that can be "developed" and those that should not be, and understanding the negative impacts of some of the modern, well-intentioned development that has occurred. And it's a good thing we brought lots of measuring tapes and a GPS system, as surveys are hard to come by in this area of the world! This village is bounded by two rushing rivers that flow all year long through a lush valley. Our initial inspiration for this beautiful site is to keep the existing community intact, that is, not to introduce development into the core of the nunnery village, and to keep all new development "light on the land." We are following principles of watershed planning to keep the valley healthy. This involves landscape guidelines for the riparian corridors and erosion control guidelines. Tourism will be handled by clusters of traditional Tibetan tents on permanent raised platforms in 2 upland sites. The tents will be operated by the nunnery providing a source of income at a reasonable rate for foreign travelers. There will be local bathing facilities at the tent sites on modern septic systems. Tents will be powered by individual 40 watt photovoltaic panels. In an area near the river, which has been built up poorly, we recommended removing the existing buildings and sanitation facilities (this term is very generous! ), and rebuilding a river terrace with guest and retreat facilities with traditional Tibetan architectural forms. New buildings will incorporate green building materials and systems, and are designed to be energy efficient. We are recommending a community scaled and operated micro-hydropower system, which is easier to maintain, less costly and cleaner than solar power for this region. A future phase includes a small hotel on another upland site, near the road. Cars will be kept out of the core and visitors will get around on foot. This trip was a cultural awakening for all of us. It's not often that we get to experience first hand living conditions reminiscent of centuries ago, coupled with modern dilemmas. It was clear to us that the Tibetans are very in touch with their land and have a deep understanding of living sustainably. It is our hope that we can help them thrive into the future. 30 Bay Area homeowners will open their doors for the Build It Green Home Tour. The tour covers the spectrum from remodeled bungalows to ultra-modern additions to brand-new houses. Admission to the tour requires the purchase of the Tour Guide Book ($10), which includes descriptions of and directions to the homes on the tour. 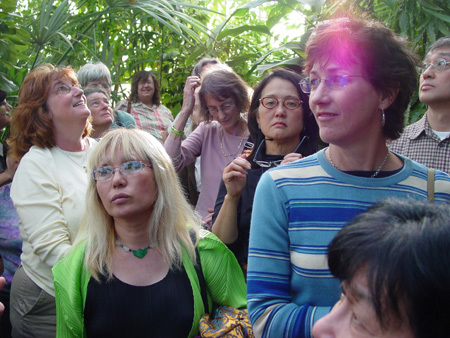 Visit an assortment of home gardens on this FREE self-guided tour throughout Alameda County. An art display nestled in a bamboo thicket. A buzzing habitat for pollinators. A hillside native plant garden and oak woodland. An edible kitchen garden complete with hens&emdash;this is just a sampling of what's in store for the day! 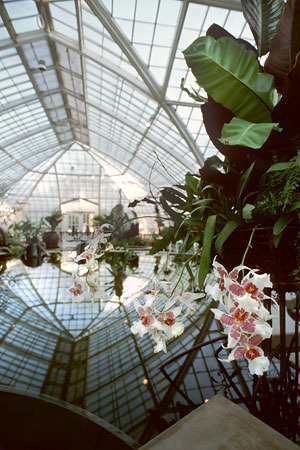 Over 30 private and public gardens will be featured on the tour. 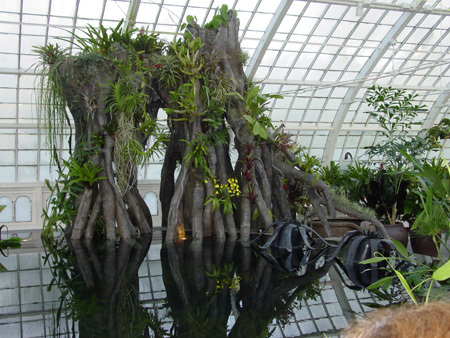 Registration is required to receive a tour guide book with garden directions and descriptions. Native plants will also be available for sale at several gardens. The BWAF offers funding to individuals and institutions to support innovative projects that advance the study and expand the recognition of women in architecture and related professions, and that lead to the dissemination of this knowledge to professional and public audiences alike. BWAF gives support in particular to research or activities that focus on the contributions of women architects, designers, urban planners, as well as architectural historians and critics, active in the United States during the period 1950-1980. Grant funding is divided into two categories: Fellowships of up to $10,000 for Scholarly Research, Publication, Exhibition, or Documentary in film or other media; and, Grants of up to $3000 for Honoraria to Plenary Session Speakers at professional meetings, conferences, or symposia whose focus matches the mission of the BWAF; and, Travel Grants of up to $1500 for research trips or professional conferences at which the recipient will be making a presentation related to the purpose of the BWAF. Applications are considered twice a year. The postmark deadlines are September 15 and March 15, and the awards are usually announced 90 days thereafter. The number of awards each year varies at the discretion of the Fellowship Committee. Successful candidates receive their Fellowship awards in two equal installments: the first is disbursed upon receipt of the recipient's written consent to the terms of the award; the second payment is awarded upon receipt of a short progress report (400-600 words) usually completed around the midpoint of the funded project. Travel Grants are awarded once, either by September 1 or by March 1. Applicants are strongly encouraged to send a preliminary inquiry to the Director of BWAF regarding their proposal and its eligibility for funding. Inquiries may be made by telephone (212) 577-1200, or by e-mail: director@bwaf.org. You can also go to the website http://www.bwaf.org/index.html for more information. 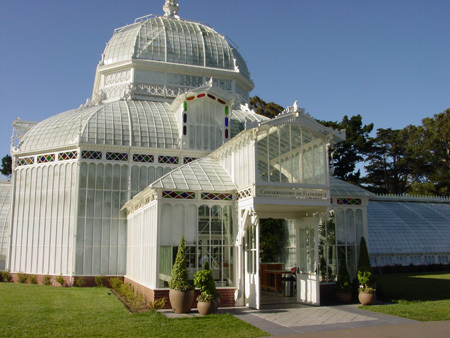 Here are some images from the wonderful tour of the building and grounds of the Conservatory of Flowers in Golden Gate Park. Special thanks to Bill Hocker and Sarka Volejnikova for these photos. Landscape Architect Jeff Miller describes some of the work.